Our Code 3 Lead Flashing is manufactured to comply with BS EN 12588 : 2006. This guarantees a consistent thickness (+/- 5%) throughout the sheet and correct amount of trace elements. 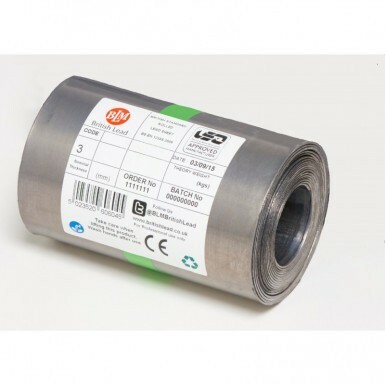 The lead therefore offers the maximum lifespan when used in conjunction with the appropriate underlays and fixings. Code 3 Lead Flashing is available in widths between 150mm and 1500mm. You can also choose from 3m and 6m lengths. With a thickness of 1.32mm and weight of 15.0kg/m2, Code 3 Lead Sheets are easy to handle and fit. Whilst other codes are suitable for a greater variety of uses, Code 3 Lead Sheets are designed to be used on soakers only. Roofing Megastore only supply the highest quality lead flashings, which have been caringly manufactured in Hertfordshire since 1932. We also update our lead pricing regularly to ensure you’re making mega savings. Is Code 3 Lead Right for You? The table below shows the thickness and weight of each lead code. Use this as a reference when choosing your rolled lead sheets, whether it for cladding, guttering or roofing applications. Have More Questions About Our Code 3 Lead Flashing? If you have more questions about our rolled lead sheets, speak to our team online or by telephone. Our Customer Care Team will help you pick the ideal roofing materials for your project, all whilst making mega savings!